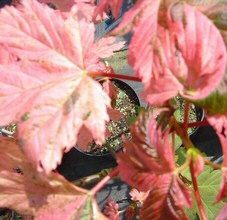 A dramatic spreading variety of sycamore, Simon Louis-Freres (Acer pseudoplatanus 'Simon Louis-Freres') is notable for its very beautiful variegated young leaves, marked creamy-white and pink. Its older foliage tunrs a pale green with somewahat irregular markings with the end result of creating a very pleasing look. Ideal for a park of large garden, expect this tree to reach a final height of 20m (60ft). Simon Louis-Freres is supplied at a height of between 1.5 and 1.7 metres in a 12L container, which means that the tree has an already established root system and therefore this tree can be planted any time of the year and with better results than either bare-root or rootballed trees.